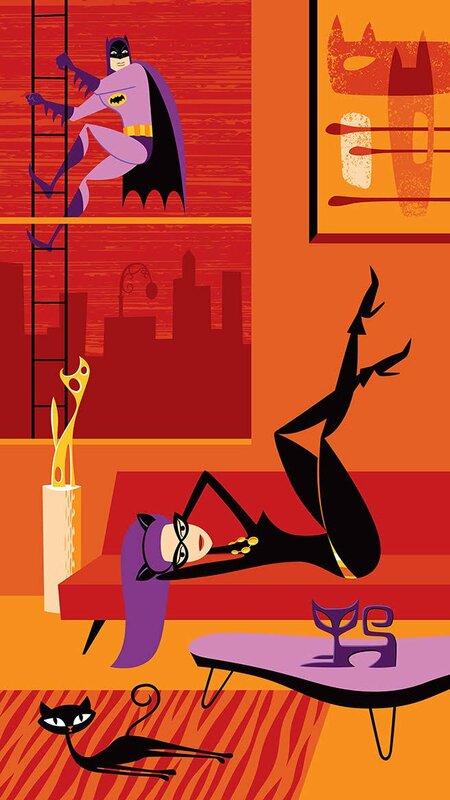 This is one Cat Lady you might not want to mess with (just ask the guy on the ladder)! Though, if you purchase this print, you can visualize cuddling up with her and her menagerie every night. Dark Hall Mansion, in partnership with Warner Bros. Consumer Products, takes fans back to 1971 and the original candy colored film, “Willy Wonka & The Chocolate Factory,” based on the Roald Dahl children’s classic. SHAG will take on the legendary factory scene that finds Mr. Wonka and his invited guests enjoying his incomparable chocolate factory. 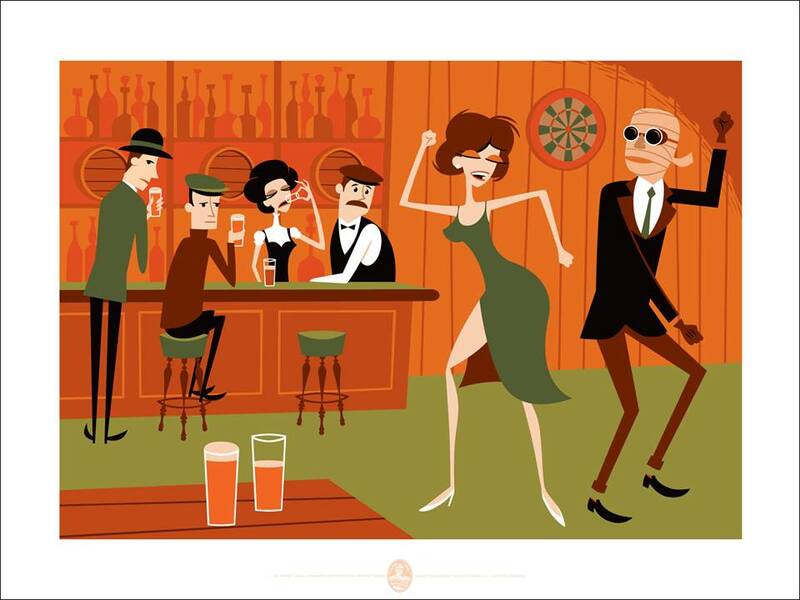 As always, SHAG not only pays homage to a classic but makes the piece his own. Be it Charlie’s discreet glance in the direction of everyone’s favorite naughty girl, Veruca Salt, or an excited Augustus Gloop not particularly taking heed of a quite SHAG’ish mother’s counsel, his piece is eye candy indeed! 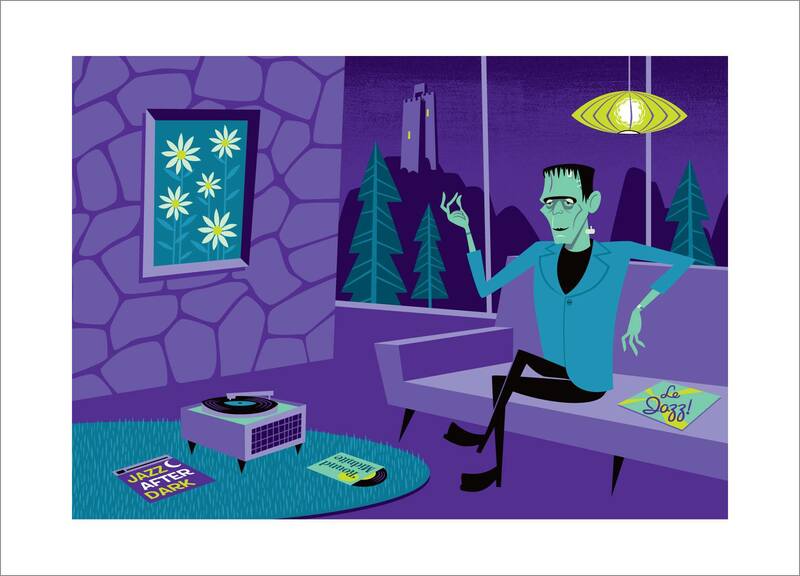 SHAG limited editions measure a rich 20 1/2″ x 40 1/2,” are full 16-color screen prints and are individually hand-signed and numbered by the artist himself. SHAG’s “Willy Wonka & The Chocolate Factory” are highly select limited edition prints with only 100 Standard editions available worldwide, and 45 in the select SHAG Variant colorway. There is also an extremely select Foil edition with only 15 examples in each SHAG colorway printed on striking foil substrate. There will also be a Willy Wonka & The Chocolate Factory Foil Edition of 15 for $695 (based on the Standard edition colorway) and a Willy Wonka & The Chocolate Factory Foil Edition of 15 for $695 (based on the Variant edition colorway). 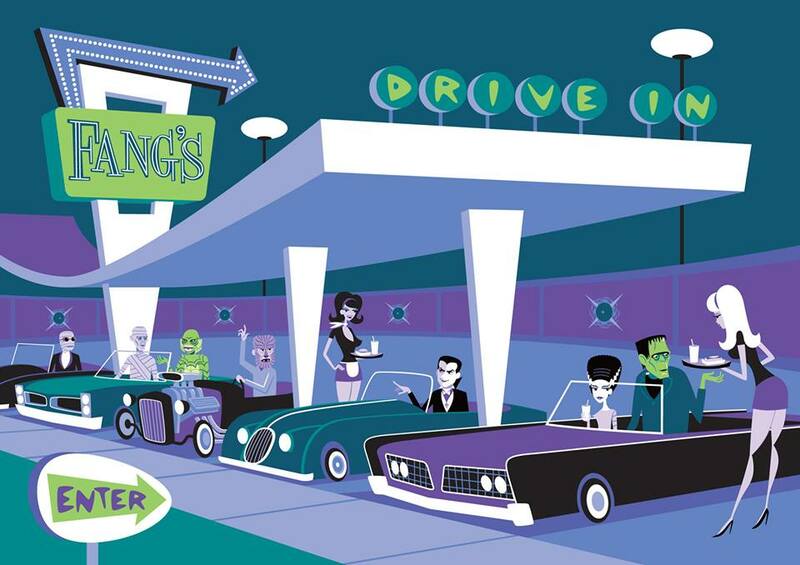 Dark Hall Mansion in conjunction with its ongoing officially licensed “The Twilight Zone” subscription series, is most excited to reveal their first guest-artist release: “The Twilight Zone” by leading contemporary artist SHAG. 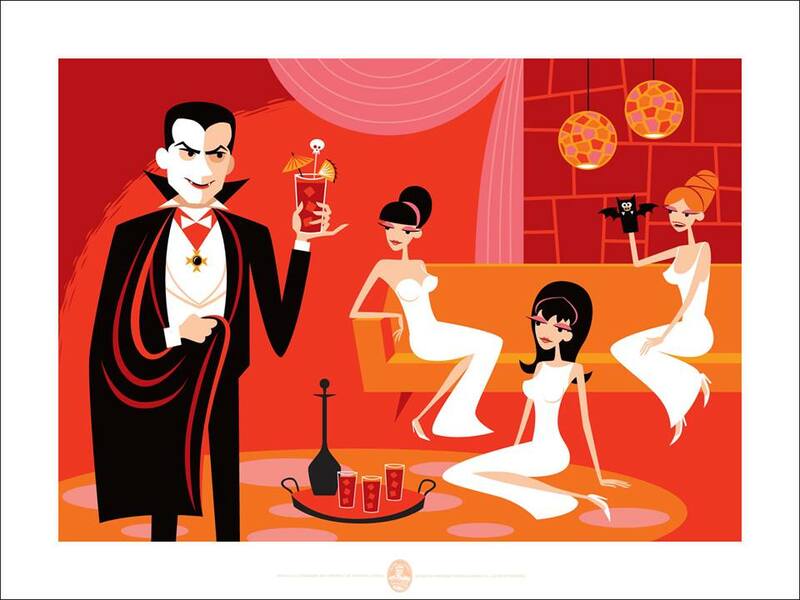 Released as an exclusive, signed, screen printed, and very limited edition, SHAG’s print measures a full 22″ x 39″ and will be available in a Standard, Variant, and for the first time ever for SHAG fans, an extremely select, signed, foil edition. 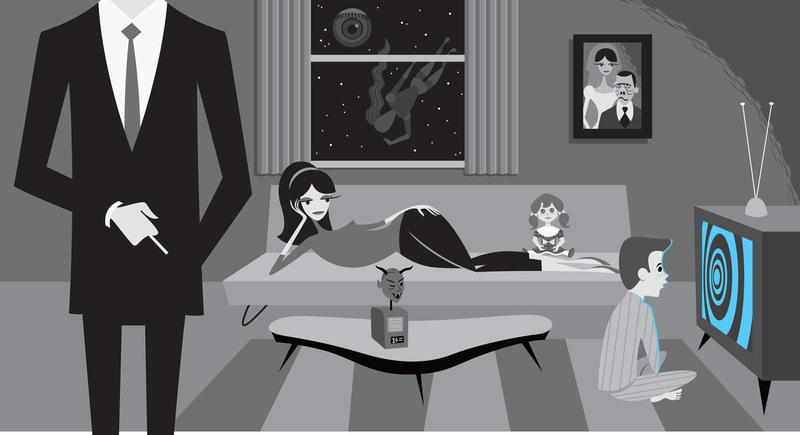 Dark Hall Mansion, under license by CBS Consumer Products, will release SHAG’s new “The Twilight Zone” limited edition prints next Wednesday, April 29th, 2015. 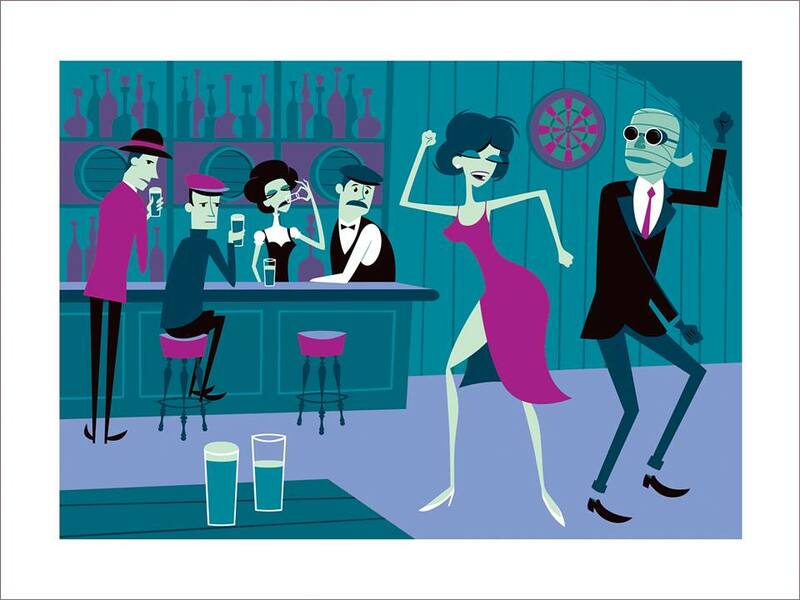 Every print from all editions will be personally signed and numbered by SHAG himself with each piece measuring 22″ x 39,″ quite large by most SHAG edition parameters, with all editions carefully screen printed to exacting standards. The standard edition will be limited to only 150 prints worldwide, the Variant to 50 prints worldwide, and the foils to only 15 pieces worldwide based on each colorway. And YES! 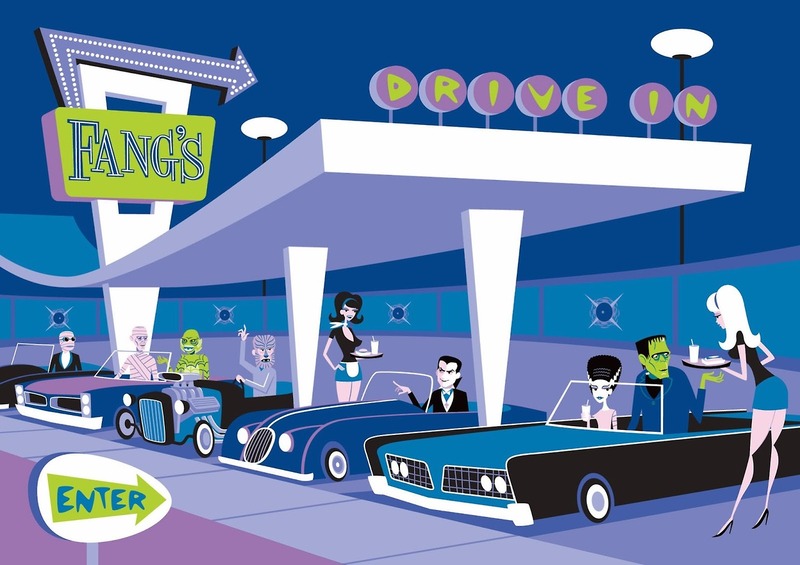 Anyone purchasing a DHM “Twilight Zone” subscription series (while subscriptions last HERE: http://darkhallmansionstore.com) will be assured a reserve spot with the right, though not obligation, to separately purchase SHAG’s “The Twilight Zone” print. 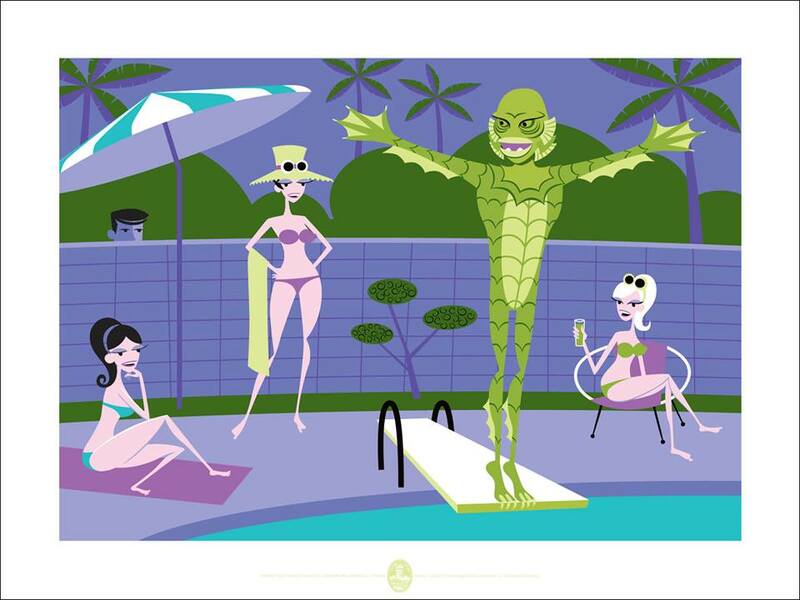 Purchase of DHM’s Standard edition “Twilight Zone” subscription series entitles the buyer to all 10 prints in the TZ series (further details in DHM’s blog here: http://www.darkhallmansion.com/?p=2269) plus the right to separately purchase SHAG’s standard edition “The Twilight Zone” print. 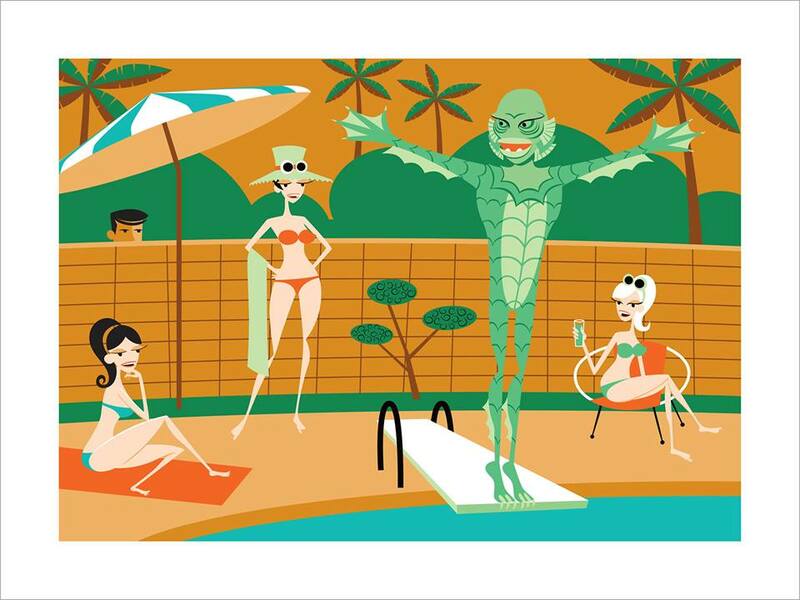 Similarly, purchase of the Variant “Twilight Zone” subscription series entitles the buyer to all 10 Variant prints in our TZ series, plus the right to separately purchase SHAG’s VARIANT “The Twilight Zone” print. Foil editions will be available only on the general sale day unless you’re one of our select “Twilight Zone” foil subscription holders in which case you’re assured the right to separately purchase one of SHAG’s “The Twilight Zone” foil prints. Yes, there are a few foil edition TZ subscriptions still available, please inquire with at: info@darkhallmansion.com. SHAG’s “The Twilight Zone” standard edition will price at $325, the SHAG Variant edition at $450, and the select SHAG foil editions of just 15 each at $575. 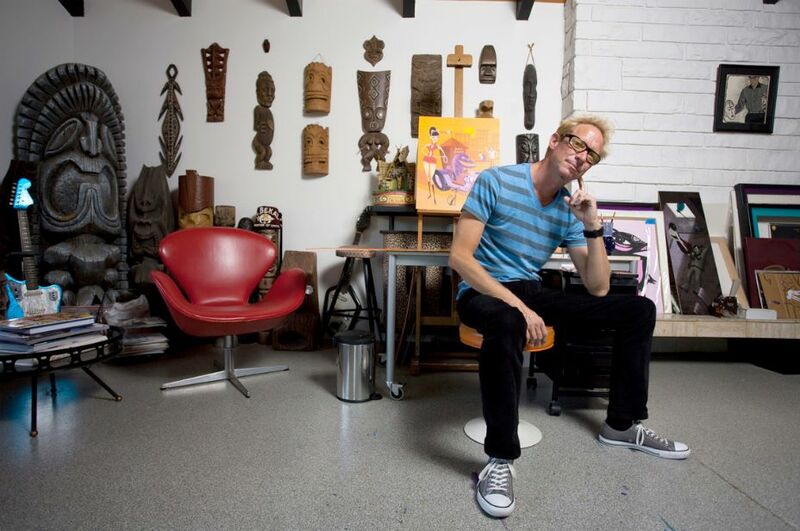 The Southern California-based artist Shag, a.k.a. 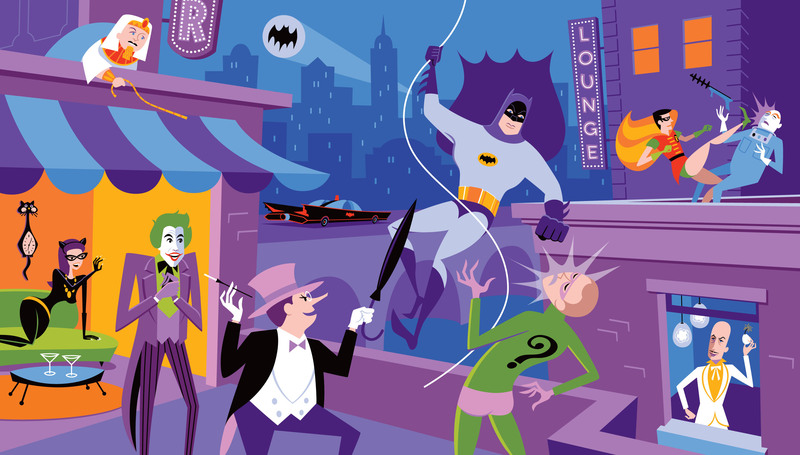 Josh Agle created this 1966 Batman inspired piece specifically for Comic-Con entitled Batman Battle Royale. Shag has had work exhibited in museums including the Laguna Art Museum in Laguna Beach, the Andy Warhol Museum in Pittsburgh, and the Naples Museum of Contemporary Art in Italy. The 150 signed-and-numbered serigraphs will be available through the Northridge-based toy, accessory and fine art print maker Huckleberry at its booth, No. 3449, at Comic-Con International, which runs July 24-27 at the San Diego Convention Center. The 21-by-36-inch image on 24-by-40-inch paper is priced at $500 before tax. 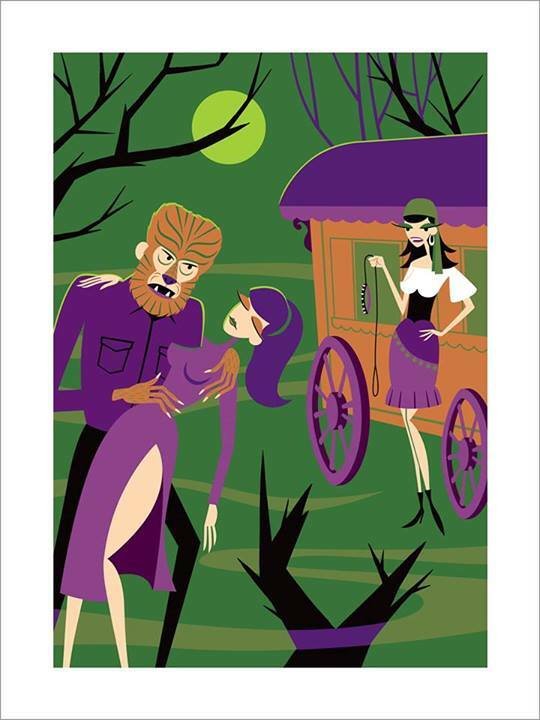 Dark Hall Mansion is simply howling this Halloween season to announce its latest officially licensed release: DHM’s “Universal Monsters x SHAG” Folio by leading contemporary artist SHAG. 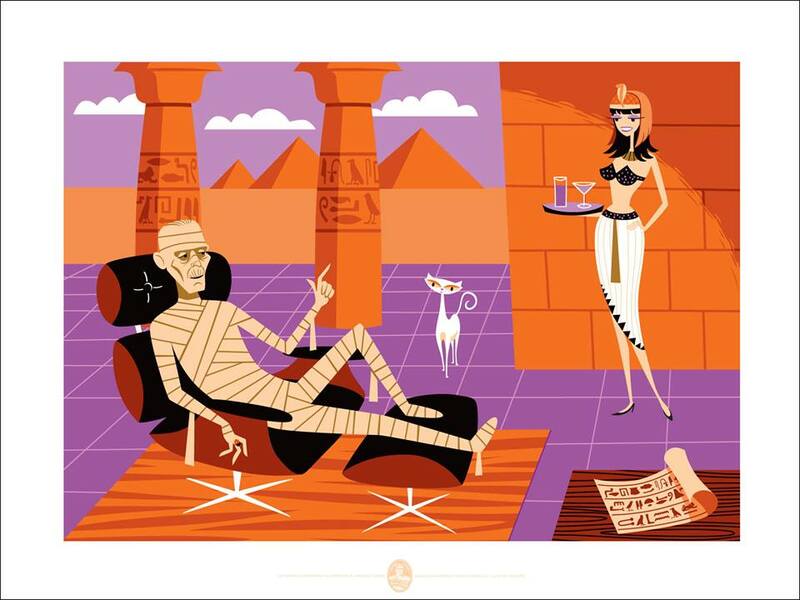 Dark Hall Mansion, working with Universal Pictures Group, is proud to offer its one of a kind SHAG thriller, the “Universal Monsters x SHAG” Folio, an exclusive, officially licensed, limited edition 10-Print Folio that any horror collector or SHAG fan will be sure to appreciate. 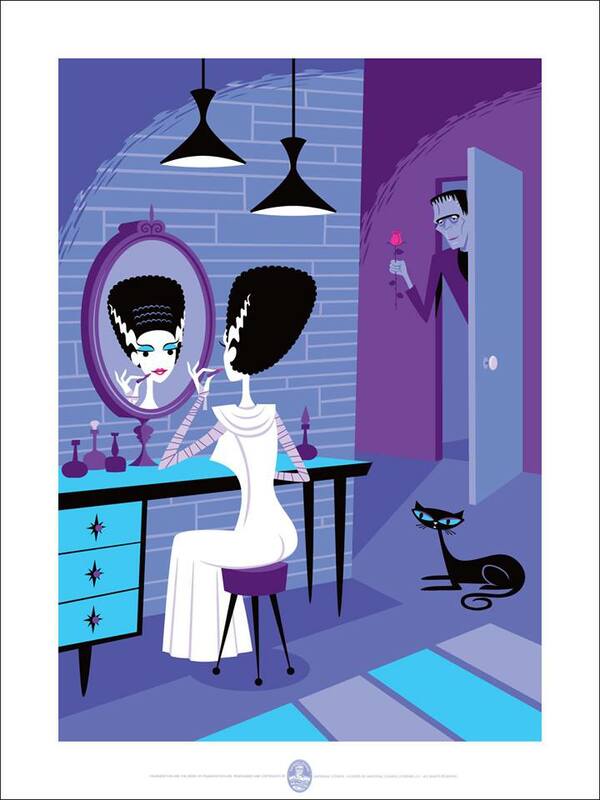 A singular Folio like no other, SHAG has brought Universal’s legendary Classic Monsters to life in his trademark style, incorporating legends Frankenstein, The Mummy, Dracula, The Wolf Man, Creature from the Black Lagoon, The Invisible Man, and a not to be missed Bride of Frankenstein, all, within a landscape that marries timeless horror films with characters that show us just how cool they were and forever will be. Artist SHAG has crafted a Folio of 8 stunning individual 18″ x 24″ prints, plus one rather mind bending 2-print splash page panoramic that won’t soon be forgotten. Each print will be individually numbered and signed by SHAG himself, each measuring 18″ x 24″ with full borders and an image area of 14.5″ x 20.5″ and with all prints being individually screen printed. This extraordinary Folio, which will come in its own custom SHAG-designed case, complete with COA, will be exclusively limited to just 150 Standard Edition Folios. The Standard edition 10-print “Universal Monsters x SHAG” Folio will price at $1,200, while an extremely limited SHAG 10-Print Variant Folio Edition will price at $1,900-with only 50 of these select Variant Folio editions available for all collectors worldwide! All Folios will first be made available for purchase to buyers of DHM’s prior SHAG release, who secured their advance purchase option then, and who will be notified by private email with a specific date (just upcoming) that they need complete their purchases by. But beginning with today’s reveal, Dark Hall Mansion will also accept waiting list registrations for any potential remaining Folios which will be offered on a first come first served basis with details to follow, also by private email, to those registering with DHM. 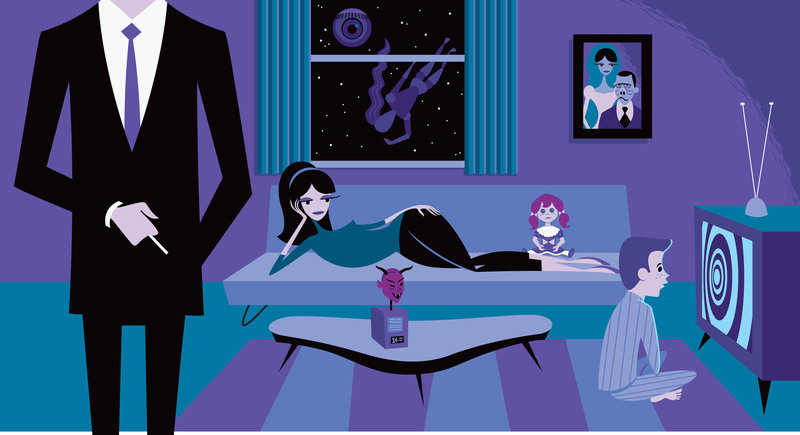 Email: info@darkhallmansion.com with the words “SHAG x Universal” in the subject line and you will be promptly notified this week if any Folios are still available after reserve buyers have been notified. More information can be found on these and other editions available from Dark Hall Mansion at www.DarkHallMansion.com. Dark Hall Mansion is thrilled to announce its new officially licensed Limited Edition Beatles release: “May I Introduce to You” by leading contemporary artist SHAG to be released on September 12, 2013. 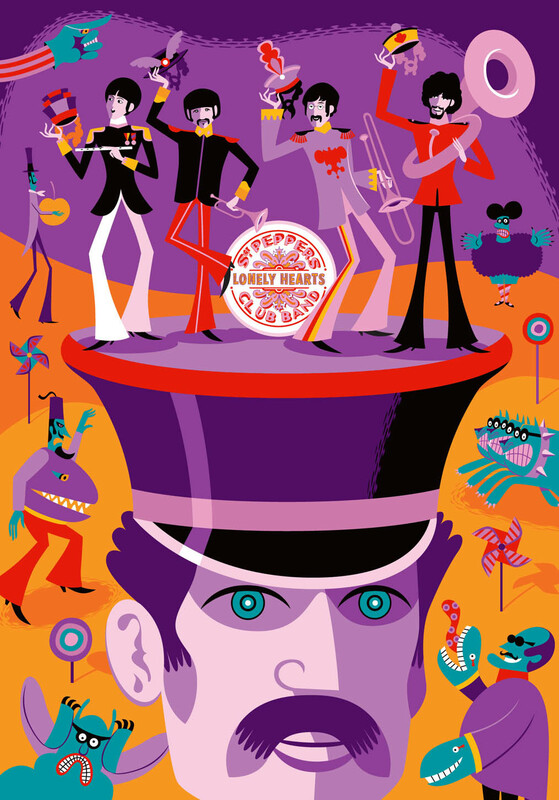 The Standard edition Beatles x SHAG “May I Introduce to You” print will price at $225 and will only be available for purchase via lottery through Dark Hall Mansion. Collectors wishing to purchase this edition need only send DHM an email with the words: Beatles x SHAG in the subject line at: info@darkhallmansion.com registering anytime during a one week period beginning 9/5/12 and closing at 11:59 PM PST on 9/12/13. At that time all registered email addresses will be assigned a number and entered into a random draw. DHM will then notify the 150 collectors with winning numbers on 9/13/13 and they will have until 11:59 PM PST on 9/14/13 to complete their purchases via Paypal. No exceptions! Failure to complete the purchase by this time relinquishes their winning position and we will move on to the next person in line on the Beatles x SHAG waiting list. As an added bonus, anyone who has their number selected in the winning draw and completes a purchase of the DHM Standard edition Beatles x SHAG print will also automatically be guaranteed a ‘reserve option’ to purchase DHM’s next SHAG release! Upon completing purchase of the Beatles x SHAG “May I Introduce to You” Standard edition print the purchasing collector will have a guaranteed lock to purchase DHM’s next SHAG release should they choose to exercise it. To qualify to purchase DHM’s next SHAG release the purchasing collector of the Beatles x SHAG “May I Introduce to You” must use their exact same Paypal address utilized with their current purchase-No exceptions for any reason. Dark Hall Mansion is also proud to have worked with Beatles.com, The Beatles’ official online store, in developing two Exclusive Variant SHAG editions that will only be available through The Beatles own, Beatles.com portal. 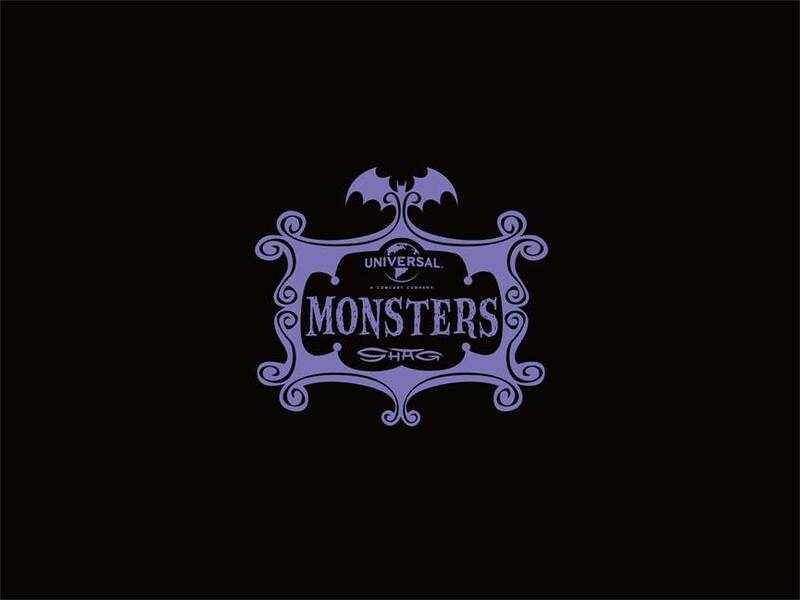 These two Exclusive and unique Variant SHAG editions for “May I Introduce to You” are also individually numbered and signed by SHAG and highly limited with only 50 and 25 pieces, respectively, available-worldwide!! The SHAG Beatles.com exclusive orange colorway will price at $500, while SHAG’s most exclusive edition, limited to just 25 pieces worldwide, will price at at $750. Again, these editions will only be available to collectors via TheBeatles.com portal and go on sale September 12, 2013!